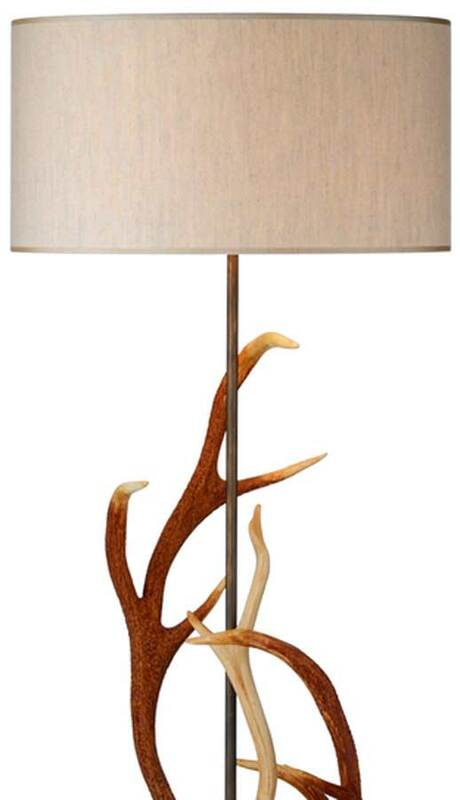 This natural antler style floor lamp has a sturdy base, with four feet and two large antlers decorating the central stem and is supplied complete with a natural cotton shade. This substantial floor lamp has been made to look as though it has been crafted from real antlers in a natural warm finish. All of the Antler lighting range is handmade in Britain and create a true rustic look. Each piece is made by craftsmen using a resin mould, then airbrushed and sealed by hand to give the desired look. This floor lamp will look charming in many rooms that would benefit from the grace and haunting design of this spectacular design. A range of natural stag rustic light fittings are available to complement this magnificent floor light, please see below for more details. Handmade in the U.K. to a very standard, please allow 2 – 4 weeks for delivery of your order.